This is “Web Exercise”, section 3.5 from the book Beginning Project Management (v. 1.1). For details on it (including licensing), click here. Locate, download, and analyze project templates. Many organizations standardize their project development process using templates. The use of templates makes it easier to compare projects and to assure that all the requirements are met. In this exercise, you locate and download a template for creating a scope statement and its completion instructions. The template is used by the State of Virginia. This template and its instructions for completion provide an overview of the structure of a project because the main parts of a project are clearly identified. Start a web browser program and go to the Office of Enterprise Technology for the State of Virginia at http://www.vita.virginia.gov/oversight/projects/default.aspx?id=567. 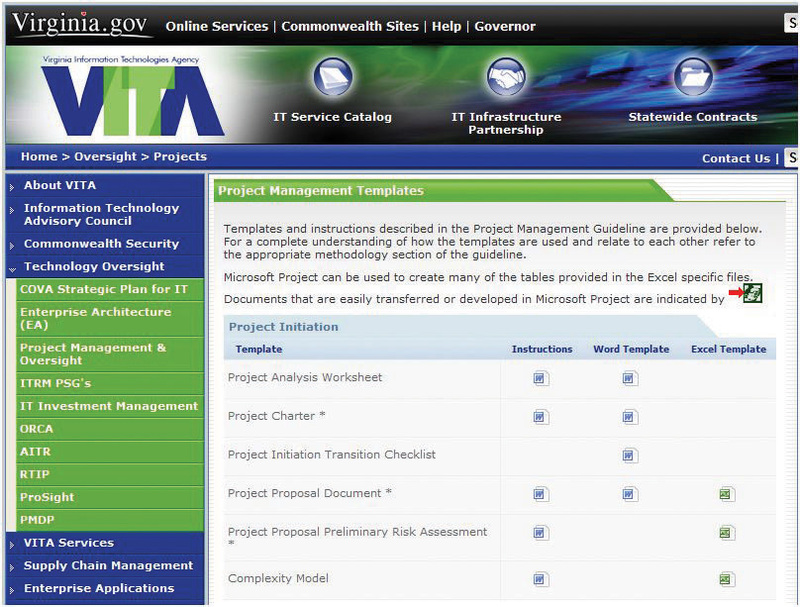 A list of templates displays, as shown in Figure 3.6 "State of Virginia Project Management Templates". Under Project Initiation, in the Project Charter row, in the Instructions column, click the Word icon. Save the file to your computer. Notice the folder in which you choose to save the file so you can find it again later. Open the file. Scroll down to page 2 and display section E, steps 1 through 3, as shown in Figure 3.7 "Description of the Project and Its Scope, Milestones, and Deliverables". Read each of the three items. Capture this screen to the computer’s memory. Start a word processing program and open a new document. On the first line, type your name. Below your name, paste the screen capture. Save that document as Ch03ScopeStudentName in the .doc format used by Microsoft Word 2003. Return to the Scope Statement Development Instructions document. Scroll to item F and then read the instructions for describing the project authority. Capture this screen to the computer’s memory. Switch to Ch03ScopeStudentName.doc and paste the screen below the first screen capture image. Return to the Scope Statement Development Instructions document. Scroll to item G and then read the instructions for describing the project organization. Capture this screen to the computer’s memory. Switch to Ch03ScopeStudentName.doc and paste the screen. Switch to the web browser program. On the Project Charter row, in the Word Template column, click the Word icon. Save this document to the same folder as the instructions. Open this document. In the Scope Statement Template, scroll through all eleven pages to review the elements of the project. Scroll to the top of page 7. 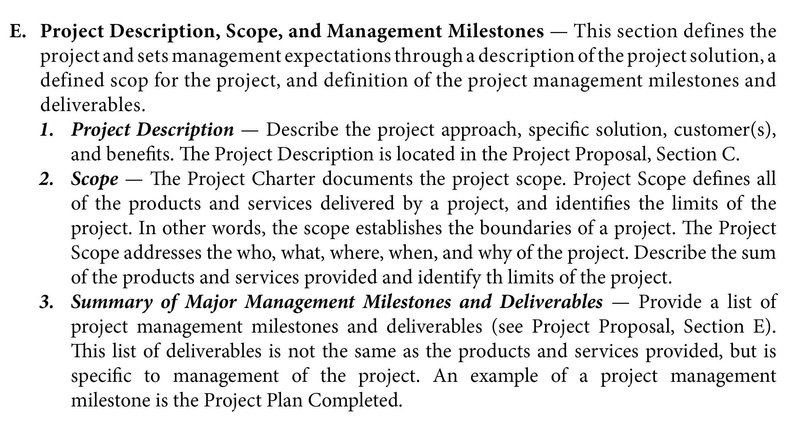 In section F, below item 2, enter your name as the project manager. Capture this screen to the computer’s memory. Switch to Ch03ScopeStudentName.doc and paste the screen below the other screen images. Save Ch03ScopeStudentName.doc and submit it as directed by the instructor. Close all documents and programs.